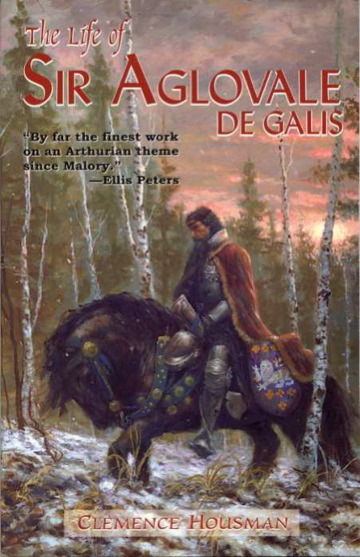 An incredibly moving story that takes place in the Arthurian mythos and centres around the life of a minor character from Malory, for my money this may be the best novelistic interpretation of the Matter of Britain of the 20th century. The prose is somewhat archaic (Housman follows Malory's style), but for me that was a plus, not a minus. The author gives us an unflinching look into the glory and the squalor of the Arthurian court and doesn't pull any punches. Aglovale is the son of King Pellinore (a man known in his day for being one of the peerless knights of his generation), and the elder brother of both Lamorak (the future lover of Queen Morgause and one of the knights who will be listed along with Lancelot and Tristan as one of the three greatest of Arthur's court) and Percivale (one of the few who will gain preeminence in the Grail Quest). From the beginning we see that poor Aglovale is doomed from the start and is not likely to live up to this pedigree. As little more than a lad he is unhorsed by his peerless younger brother in front of not only his parents, but also King Arthur himself. From there things go from bad to worse. Aglovale is never able to regain his confidence and, despite some early success in Arthur's wars of succession which gain him a seat at the Round Table, he is never able to overcome his own perceived failures and lack of merit. Thus he moves from Knight of Camelot to mercenary bandit to penitant overburdended by his own guilt and sense of worthlessness. He is a real tragic anti-hero and it is ironically not necessarily because of his quesitonable deeds, but because of his unbending devotion to truth and his inability to lie in the face of shame. Unlike some knights (such as Gawain, Kay and Agravaine...not to mention Mordred) Aglovale never denies his wrong doing and never seeks the easy way out of explanation and excuse. He calls a spade and spade and as a result ends up being showered with abuse and ignominy while other Knights of his acquantaince do deeds as bad as his own (or worse)and remain high in Arthur's favour. Indeed, Arthur is far from fully sympathetic in this tale for he seems to see in Aglovale a tacit criticism of his peerless court and is willing to let this single man bear the weight of the crimes that he refuses to deny. Still, he struggles on and manages to remain true to his own ideals even in the face of the derision and failure he meets at every turn. The flip-side of this is that Aglovale is a hard man. He spares no excuses for himself and thus does not flinch at applying the same rigorous standards to others. This of course does not win him any friends. Only his brothers and, ironically enough, Lancelot bear any admiration for Aglovale. Of his brothers only Percivale can perceive the good man his older brother is trying to be (the others view him with a sort of shamefaced admiration which vacilates between embarrassment and sympathy). For his part Lancelot sees a man able to live a life his own sense of honour could only dream of...he has too much to lose should he publicly admit to the acts he has done in private, and he honours the man he cannot afford to be. It sounds a dreary tale, and there are definitely moments of drudgery in Aglovale's life, in fact many dark nights of the soul he must endure, yet despite all that a character who is not always lovable is made sympathetic and I always find myself rooting for this underdog in the shining court. In the end Aglovale's tale becomes not only a story of a fallen man struggling for redemption, but a critique of the inadequacies of Camelot and a warning of the dangers in the acceptance of any ideal that will allow falsehood to endure for the sake of public image.